Recent research conducted by Vincent Walsh, professor of human brain research at University College London on behalf of British Airways, has concluded that there are definitive ways that we can take steps to sleep well on a plane (and feel well rested), whether we are occasional or seasoned flyers. “Sleeping on a plane is a great opportunity to reset your body clock so you arrive at your destination after a long flight, feeling refreshed and rested,” says Walsh. Have a light pre-flight meal before you board. If you can, book a seat that lies fully flat or reclines as much as possible. Take off your shoes, to improve circulation. Don’t drink any alcohol and avoid anything with caffeine, such as tea, coffee or caffeinated sodas. If you’re awake, always take the hydration offered. If you want to sleep, try to not watch any movies, use your tablet computer, or use your mobile phone. Wear an eye mask and ensure any lights around you are off and the window blind is down. If you want to relax, put in ear plugs or listen to a specially made relaxation soundtrack. Listen to your body. Sleep is not a waste of time. If sleeping pills help you, only use them at the bed time of your destination. If you’re flying from Tel Aviv to New York, take the pills at New York bed time, while you’re on board the flight. It’s important to keep your body clock at the time zone of your destination. If you fly often make a habit of these things. Sleep hygiene is a habit. 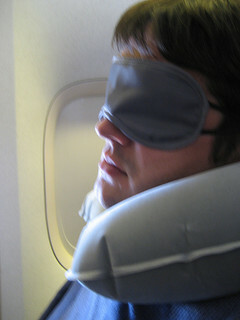 What tips do you have that help you rest well on flights? Comment below with your tips.